American made recreations of original American designs. Made of the finest steel to take and hold a very keen edge. Marked �Russell Green River Works - Made in U.S.A.� on the blade. 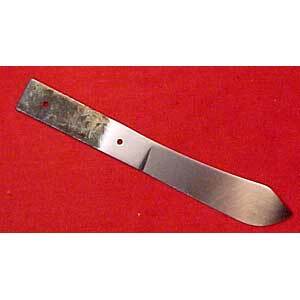 "Sheath Blade" - 4-1/2" blade, 1-3/16" wide just behind point, tapers to 7/8" at hilt; just over 1/16" thick. Overall length 8-1/2".